11- Getting to the Magic Kingdom. Don’t forget that there is no parking directly at the Magic Kingdom. You have to park at the Ticket & Transportation Center and then go from there on the monorail or the ferry boat to reach the Magic Kingdom. We have found that because of this it is generally always faster to take a bus directly from your resort to the Magic Kingdom. 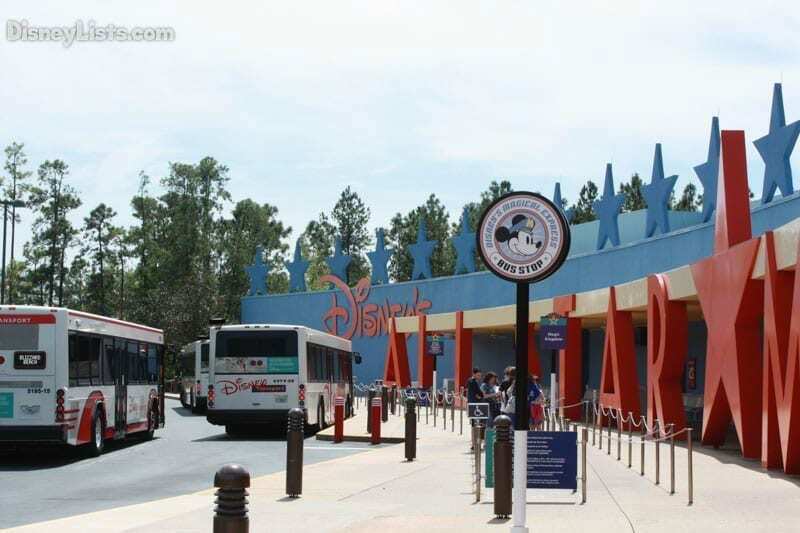 Resort buses do drop off at the Magic Kingdom, eliminating the extra travel from the Ticket and Transportation Center. 10 – You can get between Disney’s Hollywood Studios and Epcot via boat transportation. There is a boat that runs daily that connects Disney’s Hollywood Studios and Epcot at the World Showcase entrance. We find the World Showcase entrance to be super helpful since normally we want to head over there to eat anyway. 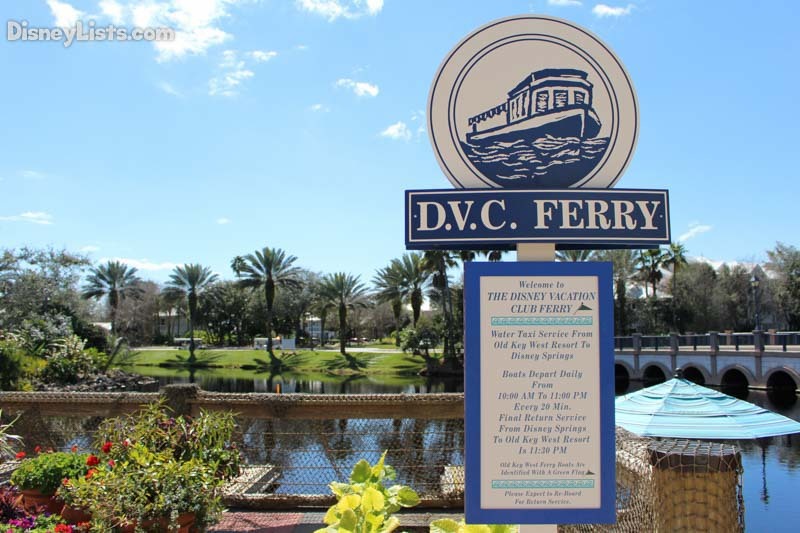 This transportation also goes to the Boardwalk, Yacht & Beach Club Resorts and the Swan & Dolphin resorts, so if you are staying there or plan to dine there, this is another great way to travel and save time. 9 – Disney Springs water transportation. There are resorts that offer water transportation to Disney Springs, that we think is faster than taking the bus and drops you off in a great location. The resorts that offer the water launch service are Old Key West Resort, Saratoga Springs Resort, Port Orleans Riverside and Port Orleans French Quarter. If you are staying at one of these resorts, it is definitely a great idea to utilize this transportation to save time. 8 – Head to the parks early. 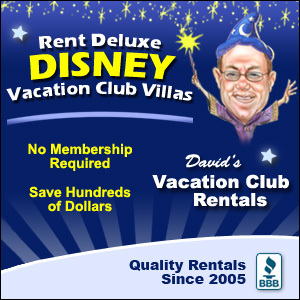 If you don’t mind being an early riser while you are on vacation, you can save a lot of time getting the parks in the morning and help guarantee that you get a seat. The buses start getting very crowded from about 30 minutes until park opening and continue that way for a couple hours. If you can beat that rush, then you will be ahead of the game and not risk waiting for the next bus to show up due to capacity limits. Plus you will be there for opening and get ahead of the other folks entering the park! The lines are usually very short first thing in the morning, so you can dash to whatever you want first. 7 – Plan to stay late. So, it is also beneficial to be one of the last people out of the park. (This is why you should take a nap during the heat of the day since you won’t be able to be up early and stay out late every single day of vacation!) If you rush out of the park when the mass exodus occurs at the end of the evening shows, then you will just be waiting in the line for transportation. Instead of wasting that time waiting for a bus, you might as well spend that time strolling through the park, enjoying the park right up until the very last minute and doing some of your last minute shopping. You get more Disney time that way instead of spending the time waiting for a bus. By the time you make your way out there, you shouldn’t have much of a wait and you may even be able to get a seat! Don’t underestimate the value of actually getting a seat after a long day in the parks! If you’re looking for a faster way to travel around the Disney Resort you might want to consider the new Minnie Van service now available on property. Through a collaboration with the US’ fastest growing rideshare service, Lyft, guests at certain Disney resorts can arrange their own private Disney vehicle right from the Lyft app on their smartphone. With Minnie Van service, Disney cast members will then whisk you away to wherever you want to be at Walt Disney World Resort. This service accommodates up to six guests and provides two versatile car seats so even the tiniest of passengers can travel in style! There are also special Minnie Vans that can accommodate guests with wheelchairs and ECVs. Minnie Van service will be available between 6:30 a.m. and 12:30 a.m. (subject to change) The cost is a $15 flat fee with a $2.75 per mile fee for a one-way trip. Guests can summon a Minnie Van from any location on Disney World property using the Lyft App. You request your van from your smartphone and pay within the app. You will also get an estimated time of arrival when you reserve your ride. For more details on this service click to read our article. 5 – No buses from Disney Springs directly to theme parks. 4 – You must fold up strollers on Disney buses and some boats. It is a good idea to keep this in mind. It will save you time and hassle. It can be really frustrating for all guests if they are waiting on you to fold up your stroller and gather all of your things. We typically try to have the diaper bag ready while we wait and then as soon as we see the bus coming, we get the stroller folded up so that we are ready to go. It will make things much smoother for you and you can get right on the bus and get a good spot. 3 – The Epcot Monorail. Don’t forget that if you are staying at a Magic Kingdom area resort or you are at the Magic Kingdom and you want to go to Epcot, the fastest way there is usually the Epcot monorail (plus, it is much more fun). 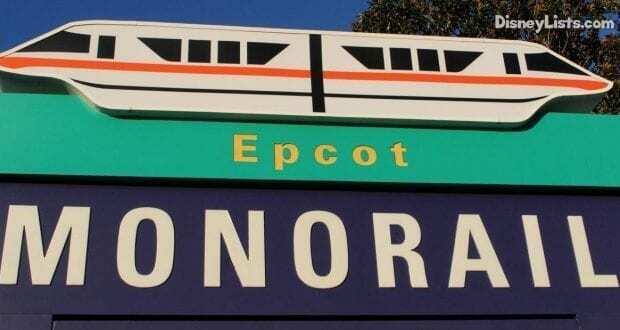 You board the Epcot monorail from the Ticket and Transportation Center. From the Magic Kingdom resorts or the Magic Kingdom, you can take any monorail to the Ticket and Transportation center and then get on the Epcot monorail. You will love the view that you get of Epcot as you approach the station, too. If you are staying at the Polynesian, it is faster to just walk to the Ticket and Transportation Center since it is so close. 2 – The World Showcase Entrance may make more sense. If you are at one of the theme parks and plan to go directly to the World Showcase at Epcot, it may actually make sense to take a resort bus to Yacht & Beach or the Boardwalk and then either walk to the World Showcase (or take the boat if it gets there pretty quickly, you don’t feel like walking or you enjoy the boat ride). The walkway or the boat will take you to the World Showcase entrance which will have much shorter lines to get in and it lets you enter right between the UK and France so you can get right to enjoying the countries. 1 – Getting to character breakfasts or other meals. If you have meals planned at other resorts, you will quickly find that the buses don’t go directly to other resorts. 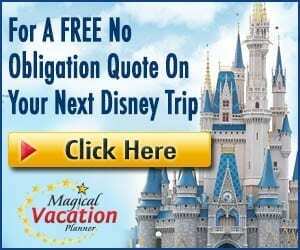 You will have to go to a theme park or Disney Springs first and then take transportation from there. The manner in which you should do this depends on where you are coming from and where you are going. Plan ahead so that you can help yourself map the fastest route. Go to the theme park or location that is the closest to where you are trying to end up, then take a bus or other transport from there to get to that resort. That will usually be your fastest way of getting around without having to drive or pay for a taxi. It won’t take as much time as it seems, but give yourself enough buffer, usually an hour, to make sure you have plenty of time to get there in the worst case scenario.